Preview of new sculptures and paintings with pre-order discount! Aren’t we all searching for eternal love? That feeling of warmth and protection can be brought to you through a handmade acrylic painting with hearts. Through its lovely warm colours, the classic symbol of love and romance creates a pleasant atmosphere everywhere, may it be your living room, hotel or doctor’s office. Your guests and patients are guaranteed to feel good when they find themselves surrounded by a romantic motif that symbolises love and care. Love is always in the air, yet it lies also deep in our hearts - our artists are precisely interested in portraying both the universal and personal aspects of love in their canvassess. Take advantage of the positive associations brought by the paintings and let love come to you. a field of lavender in paintings of Provence. Profound feelings are conveyed by the artists through soft pastel tones as well as warm colours. These dream-like motifs are therefore not only suitable for your bedroom, but for your living room as well. You can show your loved ones what you feel about them through handmade canvas paintings about love and romance. The Shabby Chic style accentuates the emotional expression in the paintings, since its soft vibes matches perfectly with love motifs. 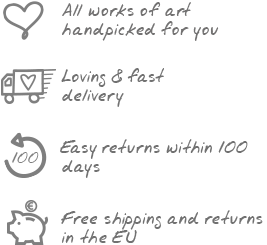 If you would like to make your partner happy by surprising him or her with romantic artworks on Valentine’s Day, then you have found the right website at KunstLoft! The artist immortalises his most passionate intentions in an expressive acrylic painting — a true show of love for life. With an artwork like this, you'll feel comforted and safe in your bedroom. Patients will have similar feelings of security when they see a romantic canvas painting hanging in your practice. Motifs full of romance for furnishing professionals with heart. *Minimum order: £99. Not combinable with other vouchers, only redeemable once per person. Vouchers cannot be paid out. Our terms and conditions apply.